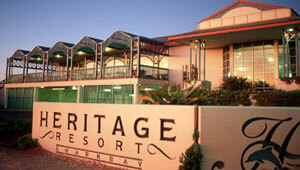 Four star luxury in magical five star surrounds is awaiting your arrival in the superb Heritage Resort hotel in Denham. Immerse yourself in the natural beauty of Western Australia’s premier tourist attraction, the World Heritage listed Shark Bay. Come face to face with the world famous dolphins of Monkey Mia, explore the surreal landscapes of Nanga Bay, Carnarvon and the magnificent Zuytdorp Cliffs. The choices are unlimited. Take in a scenic flight, indulge yourself with some world class game fishing or simply kick back and unwind in one of the worlds truly unspoilt gems. As part of the worldwide Comfort Resort network you can be assured of a warm welcome and personalised hospitality. Our quality resort offers exceptional value for the discerning traveller. All facilities are first class and our recreational and dining services are without peer. If you’re looking for a memorable break in a part of the world that can only be described as paradise on earth then the Heritage Resort right Shark Bay is waiting to welcome you.